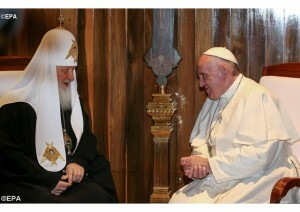 At their recent meeting in Havana, the first in history, Pope Francis and Kirill, Patriarch of Moscow and All Russia discussed the mutual relations between the Churches, the crucial problems of their faithful, and the outlook for the progress of human civilization. “By meeting far from the longstanding disputes of the “Old World”, we experience with a particular sense of urgency the need for the shared labour of Catholics and Orthodox, who are called, with gentleness and respect, to give an explanation to the world of the hope in us” says their joint declaration published in the Radio Vatican website (full transcript here). The declaration further calls on the international community to act urgently in order to prevent further expulsions of Christians from the Middle East.